The IBEROSTAR Grand Hotel Mencey is considered an example of a gastronomic hotel in Santa Cruz de Tenerife. This hotel, with a rich history of famous and important guests, has developed a wide range of services and facilities to be enjoyed by all their clients. The hotel offers 4,500 m2 dedicated to sport (paddle, gym, swimming pools…) and wellbeing (Its SPA Sensations offers all kinds of facial and body treatments). The Grand Mencey hotel is also one of the most desirable places to celebrate all kinds of events, from weddings to family celebrations or business meetings. The hotel has more than 7 conference rooms for presentations and meetings, Mencey’s Cookery Classroom, and Casa Duque, which has been refurbished to offer luxurious services in a unique environment. With respect to gastronomy, the hotel has two restaurants, restaurant Los Menceyes and restaurant and terrace Los Laureles, as well as two bars, the Iballa Cocktail Bar and the Casino Bar, where you can taste some of the most spectacular cocktails on the island. But, what makes this hotel stand out as a reference for the island’s gastronomy is Mencey’s Cookery Classroom. One of the latest news for this spring is the new degustation menu of the Los Menceyes restaurant served from Monday to Sunday, from 19.30 to 22.30h. The menu includes some of the best traditional products on the island. The menu price is 45 € and 55 € without drinks a wine pairing. The Cookery Classroom also offers visitors and residents, cooking courses with different themes and difficulty levels. For this month of April, there are two courses, an introductory course to the haute pastry, and a course on the elaboration of craft beer and a beer tasting. If you need further information on the cooking courses available, you can check the official website of Mencey’s Cookery Classroom. This entry was posted in Uncategorized on 23 April, 2015 by Luke Durden. despite the bad references given the past years associating them with cheap, regular experiences, they can’t be more wrong. Resorts in Majorcan beaches, Canary Islands, Andalusia or any other area of eastern region are ideal to give yourself a couple weeks to nothing more than rest, enjoy, and have fun. The bad reputation of the Caribbean beach resorts or the most touristic areas in Spain was thanks to the All-inclusive tourism, promulgated by new rich people who thought that a first class holiday was about close packages services that wouldn’t go further than eat, stay and leave. People that the second they got to the hotel, send their children to the playgrounds to enjoy separately breakfast, dinner, and drinks, after spending hours in the pool or sunbathing. This couldn’t be more false. It’s true that there’s a couple of travellers who do that, all-inclusive resorts in Majorca or Tenerife actually offer services far better than that. More like the resorts in Playa Bávaro or the Riviera Maya hotels. Nowadays All-inclusive hotels in Spain have moved through high class accommodations, many of them beyond 3 and 4 star. What we see is that is less frequent to see resorts that only offer the all-inclusive service. The wide variety of activities, the different given possibilities to organize and schedule their stay, are a must nowadays. Why is this changing? Time organization is vital in our society. Time management during holiday is important, we could say, it’s even more important since we like to enjoy the most of these short periods away from routine. Taking Caribbean resorts as an example, the big family hotels in Lanzarote, Fuerteventura, the mentioned Costa Adeje (in Tenerife) or Majorca, they all are trying to remodel their offer and fit into the nowadays travellers needs. Being an example the remodel plan that has taken place by the IBEROSTAR Hotels & Resorts in Playa de Palma, a hot spot in Spain tourism, they are trying to create a more exclusive and sophisticated profile for their guests. Another new category is the family resorts, where the main services are specially made for our children. The Adults Only resorts, where you can enjoy the best romantic holidays, or holiday with friends. The hotels for athletes with all the facilities you need to practice your favourite sport, for those who love sports. All these type of hotels with all-inclusive services, with flexible meal schedules and with VIP upgrades that are really affordable. Therefore, we scream our new Battle chant “A resort for my happiness”. We will bring you some reviews of this now growing tendency, especially in Spain and the Caribbean area, because holiday is something to be taken seriously. This entry was posted in Uncategorized on 22 April, 2015 by Loren Reshen. There are two ways to run a business: the hard way, large investments, low prices, small profit barely noticeable when selling large quantities, or the easy way, which is improving the product quality, offering a high standard or more exclusive service or product, therefore more expensive, making a small sale significant in capital recovery and even make a profit. The second option is the one that some hotels in Madrid are applying, especially the hotels in the historical centre of Madrid, that used to rely on a tight market with rates lower than the ones in Barcelona, they have begun to realize that giving the guests a few amenities, with a more customized services and furnishings, they can be more efficient and earn the customer’s fidelity. Madrid is a getaway trip, break holiday, business trip or touristic destination, many people enjoy the city during their flight layovers. The touristic offer has gone further than the historical heritage attraction or the fact of being the Capital city. When we see Madrid as a destination, it has become more interesting and attractive nowadays, not only thanks to the public sector investments, but the private sector concern as well, that reads between the lines and realizes that people is willing to pay for something that really worth, despite the current recession. Therefore, while you can make a reservation in a cheap second or third class hotel to spend a couple of nights, the hotel tendency, especially in the centre of Madrid, is to provide a place to live new experiences beyond resting. We are not talking only about high category hotels, but hostels, inns and guesthouses as well, they’re remodelling their premises, giving a new air, more functional, more of Scandinavian style (still trendy year by year). However, the leading voice are the big hotel chains, the 4 star accommodations in Madrid (included some 3 star hotels, some boutique hotels and some business and luxury hotels that have grown in this quality tourism in the capital). Within the improvements being made by the hotel industry in Madrid, we must highlight the reuse and restoration of antique buildings in landmark spots around the city that were abandoned or misused. The Petit Palace chain outstands with its proposal. The Basque company we’ve been talking about recently in the matters of hotel design since it’s a country pioneer that bets into turning every hotel a living experience inside the building, not excluding the facilities but making it the leading part in this whole new experience. 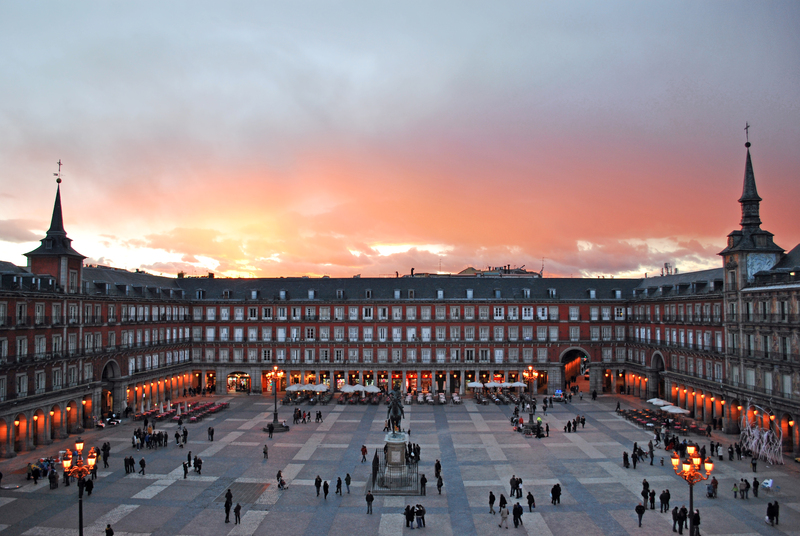 One of the most interesting examples is the Petit Palace Posada del Peine, which presumes of being the oldest one in Madrid, a city legend from past times with the perfect location in the Plaza Mayor square. With an innovating modern design that make the most of the structure, since it’s not very spacious due the antique design, a national heritage jewel. Within the recent openings, one of the design hotels in Madrid under the label of Iberostar Hotels & Resorts, it’s their first bet for an urban hotel in Spain. This Majorcan Company is specialized in beach hotels, Caribbean family resorts, but they also have some deluxe hotels in the centre of the main capitals of Europe, they never lean towards to this segment until now, and according to the customer reviews they’re not bad at all. The IBEROSTAR Las Letras Hotel named after the neighbourhood where is located, in the Gran Vía, is close to the Spanish congress and the Paseo del Prado, boasts a beautiful design and a gastronomic menu for which is listed in the gastronomic hotels of Madrid, and of course, a wonderful terrace view. These terraces are, precisely, one of the main hotel delights here in Madrid, aside from the best accommodation. Hotels are also trying to get the attention of the most sybarite travellers though their culinary menus, bars, chill out areas and even spa and wellness services. Years ago the hotel services were strictly reserved to guests, but now these are open to everybody that comes to Madrid, they’re trying to reduce costs in staff, furnishings and others, gathering more customers this way. These new open services are not a regular thing. They all are high cuisine restaurants, and trend bars destined to become city hot spots for the best of Madrid, and the most exclusive travellers, creating a unique lovely environment that worth visiting, new places to visit that any traveller should enjoy here. This entry was posted in Sin categoría and tagged 4 star hotel in Madrid, gastronomic hotels of Madrid, hotel in the historical centre of Madrid, Hotels in the centre of Madrid, Iberostar Hotels & Resorts, Petit Palace Hotels on 20 April, 2015 by Loren Reshen. It’s a luxury resort in Llucmajor, 20 minutes away from Palma, with a highway connected to the airport and with private access. The services are open even if you’re not staying in the hotel, the prices are really low considering that it’s a 5-star hotel in Majorca. You will need to rent a car, since there’s no bus routes. But thanks to that it’s a beautiful and peaceful atmosphere, something uncommon in the Majorcan resorts. In addition it’s designed to be a touristic destination, so probably you wouldn’t want to leave the hotel for a single day. But the main service is undoubtedly the Sunday brunch in Son Antem, 24 euros per person, Guest or no, can come and enjoy the best breakfast buffet, with cooking show, and freshly made dishes to enjoy outside or in the dinner room. The different views the hotel offers can be appreciated though its four different double rooms in Son Antem, the double room with garden view, double standard, double room with view to the golf course, double room with view to the pool, with all you need for your holiday, private bathroom, and balcony or terrace. Additionally, for those who travel with children, the hotel has connected and family rooms, junior suites and suites. Booking in the IBEROSTAR Son Antem is fast, easy and cheaper if you do it on the hotel chain site, or through the hotel official website, where, from time to time, they post special accommodation offers in Majorca for golf lovers, spa services and family holiday. This entry was posted in Luxury Hotels and tagged golf holiday in Majorca, Hotels in Majorca, Iberostar Son Antem, luxury hotel Majorca, luxury resort in Llucmajor, summer 2015 on 17 April, 2015 by Loren Reshen. Among the summer 2015 hotels we have decided to break our rules and be on a completely urban hotel. The new IBEROSTAR Las Letras hotel in La Gran Vía, Madrid. An accommodation that seems to make the difference. Why? For a start, it is an unusual hotel in the IBEROSTAR Hotels & Resorts group, different from the usual beach resorts except in the big variety of services that offers, which is not frequently found in a hotel in the centre of Madrid. In addition, it was conceived as a design hotel for those travellers that choose the destination as a life experience, not only to spend the night in the city, and that’s what we love about Las Letras Hotel, because it is a place you don’t want to miss if you visit Madrid. It also has one of the best restaurants in the capital, the perfect lounge areas for a pause in your trip through the city and a breathtaking rooftop. The location is perfect too, just a step away from everything you need, especially the area for partying or going out for some tapas, and the government institutions: the parliament building, the city hall and the Círculo de Bellas Artes. The rooms, the bedrooms and common spaces are designed for visitors with sense of art, quietness and exclusive environments, without feeling uncomfortable or out of place. Aimed to be a hotel for events in Madrid, it’s specially designed to host corporate meetings, product presentations, cocktails and parties, it also boasts the service of the chef Paco Morales, Michelin star, for its catering services for companies. Without leaving the charm of an antique building in Madrid, the strategies, similar to the Petit Palace firm, take the best of the building but preserve the old façade, Its coffered ceilings, the inner stairs, creating a balance spirit between tradition and a modernity and avant-garde halo that will cover you. Best way to travel in the city is through the public transport (taxi or metro). If you bring your car, there’s a parking (extra fee) near the hotel. You can also rent a bicycle which is trendy nowadays and run through the centre of Madrid, and know the parks in two wheels, a lovely experience, we can assure you. As we mentioned before to the Catering service, we can add the event counselling in Madrid, the bar, the chill out area in the terrace, in the 7th floor with a beautiful view to the Gran Vía. Another remarkable service that caught our attention was the Wifi & Walk service, it allows you to be online inside and outside the hotel, another plus is the customized service, the gym and the room service. Something astoundingly is the opportunity to book an accommodation with terrace in the Gran Vía and… Jacuzzi, beautifully decorated (not to mention the area, not a single room with less than 24 square metres, an exaggeration in the centre of Madrid, where we used to have tiny rooms) and some other services: minibar, Plasma TV, reading lamps, wardrobe, private bathroom. Booking in Las Letras Hotel is quite simple: even though you can make the reservation through its website, we suggest you to make it through the IBEROSTAR Hotels & Resorts official webpage, there you can find guarantee at the best price, plus some other hotel offers in Madrid, that you can exploit if your schedule is flexible, Check the availability before making any reservation. This entry was posted in Luxury Hotels and tagged design hotel in Madrid, hotel for events in Madrid, hotel in the centre of Madrid, hotel room in the Gran Vía, Iberostar Hotels & Resorts, Iberostar Las Letras, Madrid, summer 2015 on 17 April, 2015 by Loren Reshen. It’s about a large hotel complex next to the Magaluf beach and the main summer club in Majorca: BCM Planet Dance. It’s a merge between the Barracuda and the Pax hotel. Both part of Fergus Hotels, it offers the best accommodations for young people in Magaluf sweeten by a variety of services that will make your holidays a nonstop party. Bars, snack bars and buffet services are open 24 hours inside the complex, those who made an all-inclusive reservation will enjoy these services as much as they like. Its new facilities are outstanding, remodelled with a modern minimalistic design, inspired by a Scandinavian and Mediterranean mixed style, turning into the perfect place to relax and enjoy with your friends. It also has chill out areas, pools surrounded by bali beds, modern deckchairs, day and night dancefloors, and parties with live performances with some of the best Djs that come every summer to the BCM, offering ticket discounts to the hotel customers. This hotel, specially designed for young people also has a privileged location just a few steps from the Magaluf beach, and the most crowded streets during summer especially British travellers. It’s also 20 minutes away from the Paseo Marítimo de Palma by car, where are the most relevant bars, pubs and clubs of the Balearic capital, plus, the airport is just 30 minutes away by car or bus thanks to the highway. In addition to the resort’s all inclusive 24 hours service, it offers pet accommodation (up to 8 kg) free wifi, gym, gardens, entertainment teams, bicycle rent, lunch package, parking, brunch for sleepyheads and several outer pools with sunbeds and bar to eat some snacks in the sun. The Fun4You bedrooms are the speciality of the hotel, with intense colours and amusing furniture, specially designed for friends who like to come and enjoy the best of Majorca, for bachelor parties or anniversaries. The rooms are very spacious, modern, with the possibility to host several guests. You can book in the FERGUS Magaluf Resort directly on its website. They often make special packages with extra services in their social network. The accommodation rate, during the long weekend in May, for example, is about 160 euros for 4 night only accommodation and 232 euros all inclusive, in a regular double bedroom. This entry was posted in Majorca and tagged BCM Planet Dance, Fergus hotels, FERGUS Malaguf Resort, friends holiday in Majorca, Hotel in Magaluf, resort in Majorca, young people accomodation in Magaluf on 16 April, 2015 by Loren Reshen. Discover a wonderful city where comfort, ease and amusement are the things you will find in the Dann Carlton hotels. The Dann Carlton Bucaramanga Hotel is one of the best hotels in the city, where you can enjoy an unforgettable experience. It has a perfect combination of good taste and modern design, located in one of the best areas of Bucaramanga, this is an opportunity you cannot miss. Drop by the traditional Sotomayor neighbourhood and be prepared to live the happiest and pleasant moments of your life, with the quality services, your stay will be full of joy, as well as one of the most beautiful views of this lovely city. Elegance, excellence and beauty, all in a single place! The hotel not only has wonderful locations, thanks to its privileged and strategic location you can enjoy the near parks, malls, gastronomic areas, universities and more. Without a doubt, staying in this hotel is not just a regular accommodation but a whole new unequal experience. Have a good time in one of the most warm and beautiful cities of the world along with this exclusive hotel that offers you much more than memorable and different memories, every part of our building is specially designed for your delight. How to say no to a 5 star hotel with incredible environments? The answer is easy when you know that it offers the best rooms in Bucaramanga (1 suite, 2 Jr. Suites, 39 superior rooms, 63 queen rooms and 30 twin rooms), a poolside terrace with a beautiful view to the city, sauna, massages, gym, 6 meeting halls for 600 guests, wedding service, anniversaries, banquets and any kind of celebration, 1 bar and 2 restaurants. Plus, free wifi for your comfort. Be amazed by all the special details that it has for you! Try yourself to this new experiences, new sensations and live unforgettable moments. There are no reasons why you shouldn’t visit this Paradise. Allow yourself to visit the most comfortable locations, the most amazing views and the most innovative gastronomic menus. What are you waiting for? Do not hesitate and choose the best place for tranquillity, meetings or just for fun booking in our website, with the best prices and the most romantic, adventure and venturous plans. This entry was posted in Uncategorized on 15 April, 2015 by Loren Reshen. There are one hundred and one ways to travel, from time to time more personalized, more guided to your preferences, to your liking. Although finding that perfect destination, that perfect hotel may not be easy at all. So we have to bite the bullet and save some money to pick a 4-5 star hotel since those are the ones that, nowadays, have the most complete and varied quality services. Being an example the Iberostar deluxe hotel chain or Grand hotels, with several 5 star hotels in Tenerife, Budapest and Latin-America. Under the slogan “Resorts created to your pleasure”, we have an opportunity to live something different than usual since they have designed an exclusive accommodation package with affordable prices. The Grand Hotel Mencey is a 5 star pioneer hotel with spa in Santa Cruz, Tenerife that offer us, besides a high quality accommodation, some unique services that will make it a place we definitely will choose to stay if we travel to the island. One of the main reasons is, its gastronomic activities, gourmet meal plans, cooking courses, special ateliers, samples and tasting events. Everything is guided to the local flavours, to a gastronomic delightful destination. Besides, these plans are also thought for residents, creating a warming environment between the local people and the travellers, something not very common. Some Grand hotels in Tenerife have focused in improving their service to excellence, turning them usual holiday beach accommodation to a more solid touristic destinations like Costa Adeje. One of these hotels is El Mirador, an adult only resort located in front of Playa del Duque, thanks to this competitive advantage, they attract new clients and retain the regular customers. The strengths of these deluxe hotels are the facilities, the exclusive bedrooms, the personalized service, the gourmet gastronomy (one of the guest’s favourite feature), the private Chill Out zone, the cocktails, the comfort and last but not least its location. In the Grand Hotel Budapest case (yes, the Wes Anderson’s one), they aimed to a different strategy, more guided to a deluxe urban hotel standard, but even in this case they have tried to improve the hotel’s immersion with the location, creating common meeting and business places, sharing with another culture (The restaurants offers some quality Spain delicacies and wines for their guest and the locals too) and admiration for the city’s art and essence. This entry was posted in Uncategorized on 13 April, 2015 by Loren Reshen. Spring is the most romantic season of all, it’s the ideal time to take a few days to relax and enjoy the serenity with your couple. High season hasn’t started yet and the holy week is over now so finding a deluxe room in Majorca or Tenerife should be easy and very affordable since the prices haven’t rise. Plus, hotel services are more specialized nowadays, making the preparations for a weekend break, with all kind of activities and new experiences to find all in a single place without effort. The suites and bedrooms are the key in this type of hotels since those who plan a romantic break always look for comfortable spaces, with special amenities that lead them through a whole new experience, taking the romance to a different level. In fact, big part of the budget goes to the room specifications and is complemented by gastronomic plans, spa sessions, massages and some tours outside the hotel generally to visit monuments and natural attractions. Some of the characteristics that influence when you’re choosing a room are simple matters such as the location inside the hotel: couples usually prefer the best views from higher places, quiet floors, away from noise, crowded places or bars inside the building. The bedroom decoration and design are also important. The current trend seeks for an avant-garde design, open spaces, with minimalist furnishings but without giving up any service or complements like a TV, a living room, or a dress room, and of course a terrace. One of the preferred destinations of the travellers is the IBEROSTAR Suites Hotel Jardín del Sol, located in a spectacular ledge with a view to Santa Ponsa Bay, in the exclusive area of Costa de la Calma. Our guests also like the Grand Hotel Salomé Suites, a spa hotel in Tenerife, being one of the favourite for romantic breaks. This hotel has the advantage of being a 5 star accommodation, considered the best all inclusive hotel in Spain but aimed to VIP adults only. On the same subject is the accommodation in the Adults Only hotel Garden Playanatural in El Rompido, a place specially designed to fulfil all your needs and enjoy the beach and the unspoiled nature with your couple. In the city, hotels in the centre of Madrid are truly creative in this subject. The new IBEROSTAR Hotel Las Letras is a good example of it. As well as the hotels of Petit Palace, like the Embassy Serrano Hotel, where you will find the most distinguished travellers of the capital or the Savoy Alfonso XXII Hotel, with bedrooms that have a lovely view to El Retiro Park. We also have different alternatives like the FERGUS Paraíso Beach in Ibiza, an Adults Only hotel in Santa Eulalia, or the Tropic Garden Aparthotel in Es Canar, with family accommodation, it has more than 6.000 m2 of gardened spaces, pools, relaxation areas, sauna, Jacuzzi and everything you need to enjoy with your couple and be charmed by the white Island, with all the liberty that offers an apartment with all the hotel amenities and services. Plus, both of them are very affordable given the location. This entry was posted in Uncategorized on 5 April, 2015 by Loren Reshen.